Model NV-218A-PVD Video Transceiver with Power and Data is a passive (non-amplified) device that allows the transmission of real-time monochrome or color video over Unshielded Twisted-Pair (UTP) telephone wire. Baseband (composite) signals of any type are supported. This product incorporates the transceiver engine of NVT’s popular NV-214A-M video transceiver with the added value of Power and Data connections to and from the camera. Power, Video and Data are routed via UTP and RJ45 or screwless terminal block inputs/outputs. 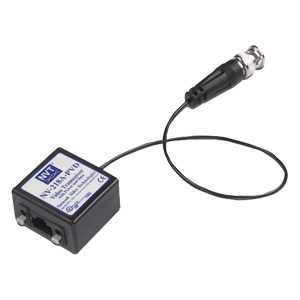 Used at the camera, the passive NV-218A-PVD has a 9″ mini-coax mini lead for direct video output connection from the camera. Along side this coax lead are two sets of screwless terminal blocks for quick pass through connections for your camera‘s Power and Data. On the “house” or output side of the product you have the option of using convenient screwless UTP connectors or the more efficient RJ45. The unparalleled interference rejection and low emissions of the NV-218A-PVD allow video signals to co-exist in the same wire bundle as telephone, datacom, or low-voltage power circuits. This allows the use of a shared or existing cable plant. The NV-218A-PVD carries a limited lifetime warranty and is UL and cUL listed.